The venerable Dobsonian reflector design has recently undergone some important upgrades and improvements. Sky-Watcher is pleased to introduce the all-new Collapsible Dobsonian complete with Crayford focuser – the ultimate in large aperture portability and performance. This elegant truss tube design was carefully engineered to combine ease of use, extreme portability and consistent performance in an affordable package. Unlike other truss tube designs, the Sky-Watcher Collapsible Dobsonian does not need to be disassembled between uses. It transports as two compact pieces that can be assembled and ready to use in just seconds! It is easy to collimate once set up, and it holds its collimation throughout the evening! This design requires no reassembly which means an ultimate convenience to the users. The bearing system has been redesigned as well. 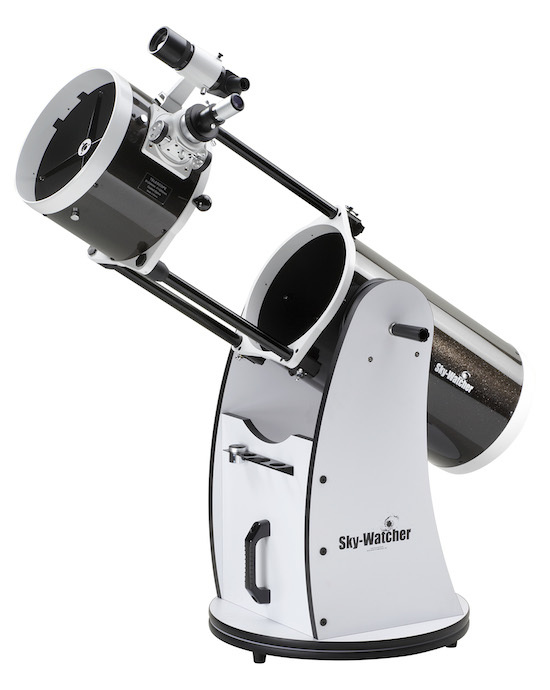 The new Sky-Watcher Collapsible Dobsonians feature buttery smooth azimuth bearings. Even the twelve-inch model can be rotated with just the push of a finger. Like our traditional Dobsonians, the new Collapsible Dobsonians feature Sky-Watcher’s patented tension adjustment control on the altitude bearings. This eliminates the need and added the cost of clumsy counterweight systems to balance the telescope. To top it off, all of the Collapsible Dobsonians are shipping with ultra smooth Crayford focusers. The 90-degree finderscope is also available.